Axis Of Oversteer: Dr. Mario Theissen to leave BMW? Dr. Mario Theissen to leave BMW? Interesting rumor, that BMW's head of Motorsport may leave the company at the end of the season. This would be well in advance of plans and might be plausible in light of the reported internal conflict which led up to the German manufacturer's decision to abandon its Formula 1 challenge. The first clue was a vague article on an Italian web site which claimed Theissen has been canned by BMW. I could not find any corroboration of that anywhere but today at the a press conference in Valencia, some more indications of possible future beyond BMW emerged. Theissen confirmed at a press conference he is working closely with Peter Sauber in finding a solution to ensure a future for the Swiss based team and hinted that his own future at BMW is uncertain. 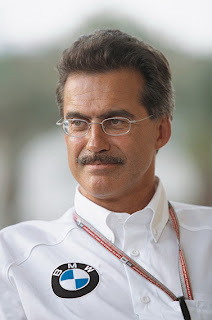 "The first priority is to secure the future of the team in my current role with the team and then after the season we can see what will happen to me,"
Theissen, who previously had revealed he only found out about BMW's decision to leave F1 the day before it was announced, was asked if he was disillusioned with BMW: "You best ask me this question again a few months from now. It all depends on what we are able to pull off." Theissen is in charge of all BMW's motorsport, beyond just F1 so this would be quite a development but kudos to him for sticking by the Sauber team to the end or, perhaps, a new beginning. Can't blame him for wanting to leave if he did. BMW's board is dictating the future of motorsports - the very same thing that put them on the map years ago - and the future doesn't look very promising for BMW in motorsports.